This weekend, dozens of art dealers from around the country will come to the 23rd Street Armory for the inaugural Philadelphia Fine Art Fair. This will be the first time Philadelphia will host a major contemporary art fair. Informal art fairs abound in Philadelphia, especially during the summer months when artists hawk their wares from booths in parks and plazas. But a proper contemporary art fair involves major galleries representing artists whose work can sell for tens of thousands – even millions – of dollars. In the last several years, these art fairs have driven the global art market, to the point where many dealers give up their physical gallery spaces, using more of their resources to have a presence at art fairs. The fair’s producer, Rick Friedman, has a long history of staging art fairs in the Hamptons on Long Island; Aspen, Colorado; Palm Springs, California; San Francisco, and Houston. He believes the Philadelphia art market is ready for this. These fairs are not cheap. One local dealer, Bridgette Mayer of Bridgette Mayer Gallery, is spending between $15,000 and $18,000 to participate in the fair, most of that to cover the rental of two booths on the floor of the fair. Mayer gave birth to a baby just days before the fair, so her staff will run the booths. Being at art fairs in other cities is part of her business model. 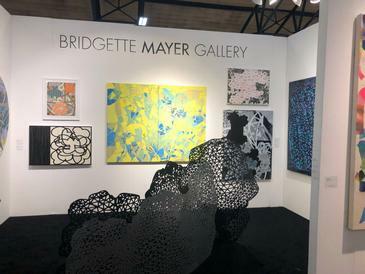 Mayer recently stopped putting on shows in her own gallery space on Walnut Street, focusing more resources on art consulting, curating, and hosting private viewings for prospective clients. Mayer said she’s optimistic about the new Philadelphia Fine Art Fair, but cautiously so. In 2015, Friedman sold his art fair empire, Hamptons Expo Group, and got out of the art fair business. That didn’t last long, and the Philadelphia Fine Art Fair marks his return. Friedman is already planning another art fair in September in Jackson Hole, Wyoming, the ski resort town. His art fair will be incorporated into Jackson Hole’s annual 12-day Fall Arts Festival.